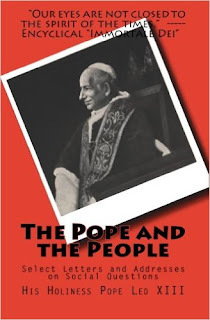 THE book on Catholic Social Order. What is Church teaching on healthcare, capitalism, finance, jobs, business ethics and socialism? The answers will surprise you, inform you and challenge what many assume Catholics believe about the biggest issues of our time. His Holiness Pope Leo XIII speaks plainly and teaches with wisdom and brutal honesty about what the Gospel demands of us, specifically in society today.